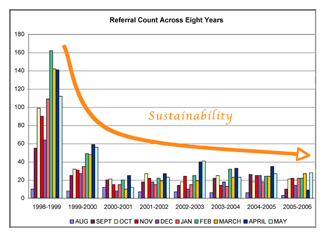 The graph shows referral data by month over an eight-year period. Referral counts dropped significantly in the first year of Foundations (1999-2000) and they have remained at that level across seven years. 44% of students qualify for the Free/Reduced Lunch Program. 37% of students receive Special Education Services. Read about the Foundations project at Blanco Middle in our Winter 2007 newsletter!